Spring is here! Time for warmer weather and fun family holiday get-togethers. You'll find a lot of spring recipe here including this tasty, fresh berry recipe. 1-Bring pot of water to a simmer. 2-Combine egg yolks, sugar, lemon juice and zest in a heat resistant bowl and whisk until smooth. 3-Set the bowl over the simmering water and whisk at least 10 minutes until the curd has doubled. It will be very thick and yellow. Don't let it boil. 4-Remove the bowl from the heat and whisk in butter, a few pieces at a time until all melted in. 5-Place in fridge until cold. 1-Fold the whipped cream into the chilled lemon curd. 2-In a large glass trifle bowl, line the bottom with the cut up angel cake. 3-Spoon the lemon curd over the cake. 5-Repeat the layers until all the ingredients is used up. Last layer should be berries. W-o-w. That is an amazing Lemon Curd Trifle! The triple berries made it even more scrumptious! Thanks for sharing this recipe. I am bookmarking the page so I can try it. It looks delicious. If you get a chance stop by my blog Recipe for Life at: http://deborah-bateman.blogspot.com and check out some of my family favorite recipes. yum!! I have pound cake in my freezer from costco that I was wondering what to do with!!! 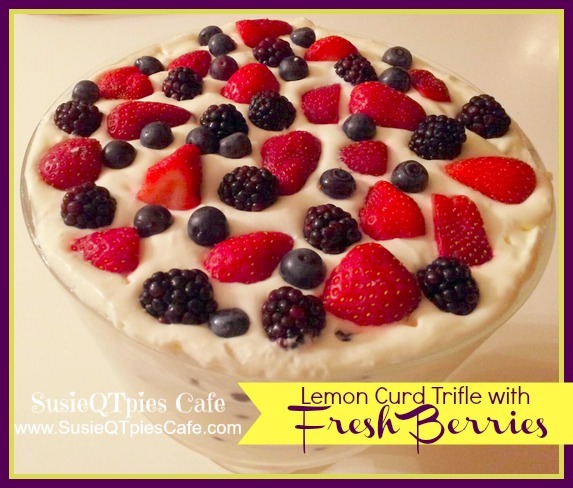 This Lemon Curd Trifle look so delicious! I'd love for you to link up a few yummy recipes at my weekend link party@The Weekend re-Treat! Yummy! I love lemon curd! I love anything with lemon curd! WOW! Lemon curb & berries. Yumminess!!! !